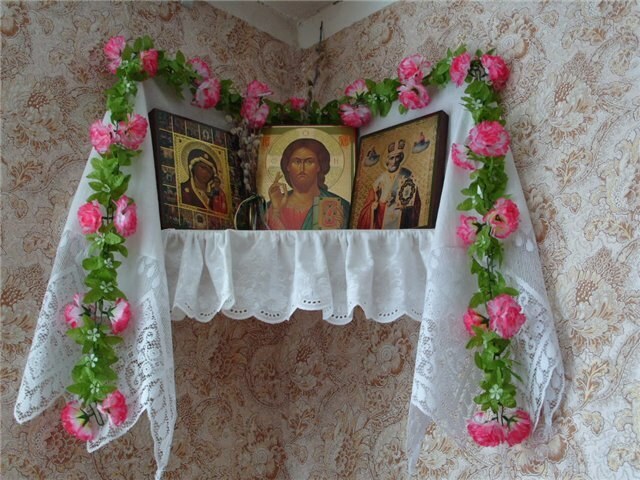 On the question of how to distinguish Orthodox Christians from all other people, 9 out of 10 people will answer: "Orthodox Christians have icons at home". Of course, the mere existence of icons does not make one a Christian, but to have them in your home is necessary. It is sometimes said that Christians "worship icons." This is not so. Praying, people are not drawn to the icon itself, but to the one who is depicted on it: the Savior, the mother of God, some Holy. Look at the icon helps you focus, Refine the image of the person to whom appeals praying. In the home of the iconostasis must be icons of the Saviour and mother of God. The presence of icons of saints is not so necessary but desirable. It can be the images of those saints who patronize family members – according to the names given at baptism. You can purchase the icons of those saints to whom family members turn most often. For example, in the house of the military may be the icon of St. Demetrios, St. Theodore Stratelates, St. Alexander Nevsky, or other Holy warrior, in the doctor's house – the icon of St. Panteleimon the healer, or St. Cosmas and Damian. Finally, the Christian can experience a special homage to the Saint, whose exploits made a strong impression on him – the image of the Saint can also be in the home iconostasis. By purchasing icons, need to think of them as relics, not as things of value or decoration. Do not chase expensive or rare icons. It is not compatible with the Christian spirit icons of precious metals sold in jewelry stores. To accept this icon as a gift, but purchase is not necessary. Best buy icons in the Church shops where they are sold already sanctified. Also, there just won't sell a questionable image of "folk saints, not canonized by the Church. In old times icons were placed in the Eastern corner of the main room – it was called "red corner". This is due to the special symbolic importance attached to the East side in the Bible: in the East, God planted the garden of Eden, to the Eastern gate House of the Lord the spirit leads the prophet Ezekiel, etc. Unfortunately, the location of Windows and doors in modern homes is not always possible to place the home iconostasis in the Eastern corner. In this case, it may be in any other place. The main thing is that icons were a separate shelf where no one will put photos, paintings, pictures, statues, and other secular subjects. Do not place icons near the TV player or computer, because these items are associated with worldly things. To put the icon on the bookshelf is allowed, but only under the condition that the contents of the books standing on it does not contradict the Christian creed. We cannot allow the icons next to the hanging posters or calendars featuring singers, actors, and other secular idols.